Reclaimed Roof Slates - Reclaimed Slates - Reclaimed Roof Slates uk. No more than 3% wastage guaranteed. Burlington Grey Slate and Westmorland Green Slate. Every slate hand sorted and graded by Roof Slates. Roof slates is a major UK slate supplier of Reclaimed Slate. Family run business, with over 30 Years experience supplying Reclaimed Slates. 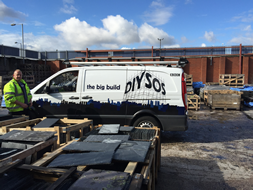 We supply reclaimed slates to a wide range of building merchants, construction firms, local authorities, self build customers situated throughout the UK. Roof Slates are proud to be one of the leading UK specialist slate suppliers of reclaimed slates, with over 30 years experience in the reclaimed slates industry. We know what good quality reclaimed slate looks like, and pride ourselves on offering only the very highest, quality reclaimed slates. We have built up a strong reputation for supplying building merchants, construction firms and local authorities with quality reclaimed slate as a result of our attention to quality, and the fact that every reclaimed slate which we sell has been rigourously checked and graded by ourselves. Do not hesitate to get in touch with Roof slates to discuss the different variants of reclaimed slate which we currently have in stock, and to take advanta ge of our expertise and advice. 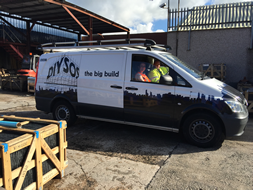 Our premises is located in Ashton-Under-Lyne on the outskirts of Manchester, and we welcome collection of all reclaimed roof slate or alternatively, we can arrange national and international shipping on all orders of our reclaimed slates. Reclaimed Roof Slates as old as the earth itself. Slate has been formed by a process which is almost as old as the earth itself. it began when surface rocks were worn away by wind and water and deposited on the floor of the ocean that covered this area of Wales. The deposits, through the Ordovician period, some 500 million years ago, became buried beneath the earth and were subjected to intense pressure and heat, forming them into sedimentary rocks. Later movements in the earth's crust exerted immense forces upon these rocks, forcing them up into colossal strata's on the mountain sides as the waters receded. For centuries welsh slate has been used for the roofing, cladding and flooring of buildings world-wide, from cottages to palaces. Due to slates natural qualities, and characteristics it is ideally suited for prestigious projects. Its uses are not only limited to roofing, but can be used for steps, pool surround, kitchen tops windowsill's etc. Its uses are only limited by one's imagination. roof slates are produced from a natural material, each individual hand made roof slate will have its own unique visual characteristics. 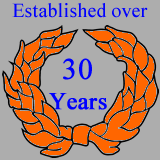 Family run business, with over 30 Years experience supplying Reclaimed Roof Slates. Normal wastage in Transport of any slates New or Reclaimed is approximately 2% to 3%. Normal wastage to get the Slates up to Roof Level is approximately 2%. Reclaimed Slates are bought from demolition sites / refurbishment projects etc. Once purchased they are sorted and graded either on site or back at our premises. Sorted Slates: Broken and unusable slates discarded, and then all usable slates are crated / palletised and counted ready for sale and transport. Grading of Slates: i.e. we ensure that each job / batch of slates are kept together so that the end user receives the slates from the same job / batch. This is so that the slates in each crate / pallet are as similar to each other as possible. This sorting and grading process ensures that the slates supplied to the roofer are as suitable as possible for his project. The Roofers: sorting and grading is a completely different process which involves sorting thickness, coursing, re-holing and dressing ready for fixing to the roof. Wastage: when fixing the slates depends on many factors i.e. the complexity of the project, ( valley cuts, skylights etc) and the experience of the Roofer. Taking all these factors into consideration, we recommend you allow approximately an extra 10% when ordering your slate. The waste created by the roofer's sorting and grading process should be calculated into the quantity of slates ordered. This can vary greatly due to the type and complexity of the roofing project, and can be especially high and difficult to predict when using Random Sized Slates. It is very difficult to work out your expected Coverage and Wastage from just looking at the slates in the crates, because of the nature of the slates all being random sized. This is where the experience of the Roofer and/or Purchaser is essential. When we supply random sized slates, we can calculate an approximate m² coverage per crate, from the variation in the sizes and number of slates. You should also take into account that when the roofer's dressing and coursing of the slates in preparation for fixing is complete, the purchased m² may be insufficient to cover the area required. Therefore, additional slates may need to be purchased. You may have to make a random sized slate smaller, which can still be used on the roof, but will reduce how much your purchased m² will cover, and increase your wastage %. Therefore the true calculation of wastage is only possible once the project is complete. Roof slates supplies ITV - CORONATION STREET with Reclaimed Welsh Slate. Roof slates supplied the reclaimed slate for the new set of the most famous Street in the uk. 12,000 - 24 x 14 reclaimed welsh slates, supplied for Coronation Streets new set. 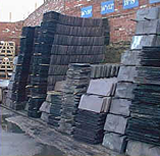 Roof slates is one of the largest suppliers of reclaimed welsh slate in the uk. We delivered 18,000 Balmoral Grey Chinese Roof Slates. Click below for All Slate Prices. The Bitterness of Poor Quality Roof Slates, Remains long after the Sweetness of Low Prices.